First Post from Amed, Bali in Indonesia. After spending one month in the Philippines, we continued our journey to Bali. Here we’re staying at Bluestar Bali, a cute Bungalow resort located on the beach. We are very happy with our choice. 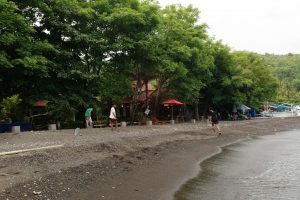 The staff is super friendly and helpful, the Indonesian food is delicious and the nature around us absolutely beautiful. The plastic waste here is not less of a problem. However, we found some practical alternatives and an important project right next to our village. To find out more about the Peduli Alam project, please have a look at the post on our Facebook Page (@onlyplaneta). 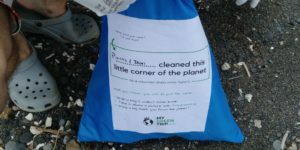 We would also like to share with you the quick story of our latest beach clean up. 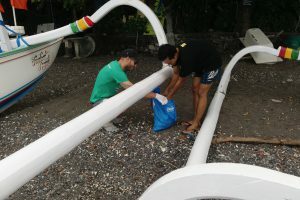 We started picking up waste on the beach in front of our bungalow, when suddenly two young locals showed up, asking us what we were doing and why we were not snorkelling instead. We explained that we were picking up trash, especially plastic waste. We explained how plastic breaks up and ends up being eaten by the fish, the same fish he eats. We asked if they wanted to help, so they ran to get their own bag. Together with Kadek and Alit, we cleaned up and talked about the impact this waste has on the environment. They both seemed interested and they enjoyed doing something good. It was touching when they thanked us “for helping Bali”.